The last two digital albums I bought from Amazon’s service. I have to admit that Apple finally has some competition here. Don’t get me wrong, I’m still an Apple fan boy, but I’m not blind. Amazon trumps Apple in three major ways: price, bitrate, and DRM (most tracks are .89 or 8.99 for the album, the bit rate is 256kbit, and there is no DRM). Amazon even tries to play nice with iTunes. Frankly, they’ve done a damn good job. 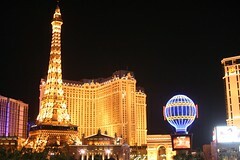 Cara, Reneé, Ben and I just returned from a short Vegas vacation today. Overall we had a lot of fun, even if our feet are sore. There’s not much relaxing to be done in Vegas, and if you want to see the sights, you do a lot of walking (I’m not sure if we walked more in NYC or Vegas). We saw a lot, but missed so much, that we could have easily been there for twice as long and still not gotten everything in.